"Can we stop on the way for a bite?" James D'Ampton - "Do you have children?" Silvia Marsh - " "Only if there aren't any men around." Image Transfer Review: The image is slightly soft with fine grain evident, but suits the nature of the film. While not reference material, the transfer and elements are quite good, with no signs of edge enhancement, and only minor dust or other anomalies in some scenes. It is encouraging to see films of this nature being taken care of in their DVD incarnations. The anamorphic transfer is a definite plus. Audio Transfer Review: Audio is clean and free from much hiss. The surround soundtrack has reasonable frequency range and good dynamics. Music cues and atmospheres fill out an otherwise center focused dialog track. Location ambience occasionally detracts from dialog clarity, but overall the sound is fine and suits the feel of the film quite well. Extras Review: It is very encouraging to see attention to extras being included alongside cult films like Lair of the White Worm. Sharpline Arts was involved on this release, which includes a great commentary track by director Ken Russell (Altered States, Women In Love). Russell switches between tongue-in-cheek jabs at his film and cast, production trivia, and historical references. He is never boring, with just the right amount of fun offsetting interesting bits about the film. Text sections include a Ken Russell biography/filmography is included along with cast biographies. Essays on the special effects sequences and on the original novel and adaptation are also included. These text screens are accompanied by behind the scenes shots. There is a fair amount to learn in the supplements, and they round out the disc quite well. The theatrical trailer and a brief TV clip are also included, along with a trailer for another Sharpline/Pioneer release of Ken Russell's Salome's Last Dance. 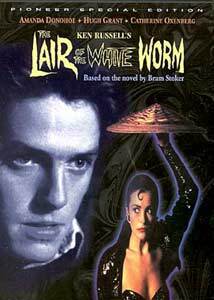 For classic camp fare you can do no better than Lair of the White Worm, this is definately among the cream of the crop for the genre. Pioneer and Sharpline Arts have assembled a respectable supplemental feature set for this release, certainly not a half-asped job. Ken Russell's commentary is worth the price of admission alone. I wish all films of this nature were afforded this kind of attention. If you enjoy offbeat horror/comedy this is a must have for your collection.